The population is aging; the number of contributors is decreasing. 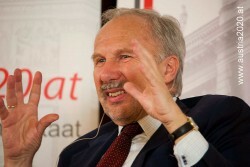 For Ewald Nowotny it is clear: An increase in the statutory retirement age from 65 years could be one way out of misery. The current debate was triggered by a recommendation of the European Commission to gradually raise the retirement age to 70 years.